Site of the historic 1948 multi-racial tennis match in then-segregated Druid Hill park. 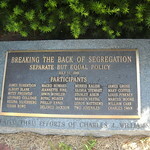 A plaque commemorates the participants. The tennis courts have since been moved to another area of the park.